Produced in 100% poly-ribbon, a 100% light-weight polyester ribbon sewn together in multiple layers. Hand wash cold. 3" structured brim creates a clean silhouette. An internal drawstring adjusts fit. Available in two sizes: M/L (59cm) and L/XL (61cm). 100% polyester ribbon exclusive of trim. 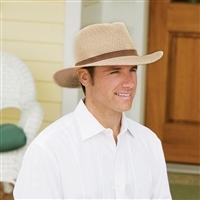 3½" brim with a black ribbon trim. An internal drawstring adjusts fit. Available in two sizes: M/L (59cm) and L/XL (61cm). Zig-zag stitching adds a modern touch to a classic look. The sturdy 3 1/4" brim offers ample shade for every summer adventure. Black ribbon detail. Internal drawstring adjusts fit. Copyright © The Old Town Hat Shop. All Rights Reserved.